Fallas festival is a traditional celebration in the Region of Valencia. It’s celebrated with light, colour and fire, which will flow among us all from the 15th to the 19th of March, filling the streets and squares of villages and cities. From this friendly land we invite you to meet and live the Fallas of Valencia, the most internationally known festivity. For five days, firework displays, mascletás and cardboard statues or monuments are the protagonists of different cities, where the smell of gunpowder blends with the finest flower scents, sound of music of the marching bands and the masclets. A whole transformation that precedes the Spring season, accompanied by numerous activities, competitions and parades, all in celebration of the Fallas of Valencia. This yearly tradition’s origins date back to the Middle Ages, however, it wasn’t until the beginning of the twentieth century that the Valencian Fallas acquired a similar shape and appearance we are familiar with nowadays. These gigantic satirical creations are all set on fire one after another on the night of 19th-20th of March, with the exception of one, which is saved by a public vote and passes on to be displayed in the Museum of Las Fallas of Valencia. 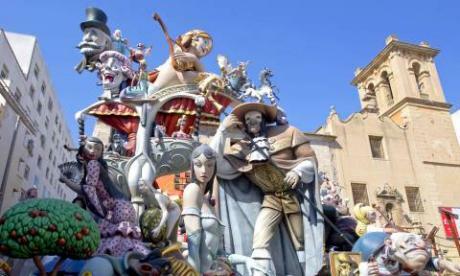 View the video: "Fallas of Valencia, UNESCO Heritage"